This week's French Fridays with Dorie features a nemesis of mine - salad. I am so not a salad kind of girl. The salad concerned is a Deconstructed BLT and Eggs - that's right, a sandwich reborn as a salad. I was amazed at how well the bacon cooked up without any added fat in the pan - which makes me shudder at how the average fryup feautures bacon cooked in even more fat. This salad was really very tasty, with its mxture of sharp, sweet and salty flavours, and I would definitely make it again. To see what the other FFwD participants thought of this salad, visit the LYL section of the FFwD website. This week, I have the baking bug, so I am on a mission to bake things from ingredients that I already have. Living in my refrigerator, I had a big pot of natural yoghurt nearing its expiry date, so the natural choice was to make a yoghurt cake. After a quick flick through my cookbooks, I found a recipe for Berry and yoghurt muffins on p378 of the Australian Womens Weekly Bake cookbook. Bingo! I had a box of frozen raspberries for the berry component, and together with the fact that it was a quick and easy recipe to make, I knew I had found what I wanted. These muffins were rather tasty - because they contain rolled oats, they some texture , and the raspberries added some tang. Preheat your oven to 180 degrees Celsius. Line a 12 hole muffin tin with muffin cases. Sift the flour into a bowl, then add the oats, eggs, sugar, yoghurt and oil, and stir to combine. Fold the berries in gently. Spoon the batter into the muffin cases (I like to use an icecream scoop), then bake the muffins for approximately 25 minutes. Remove the muffins from the oven and allow them to stand for 5 minutes in the pan before unmoulding onto a wire rack to cool completely. There is a chain of French cafes in Melbourne called Laurent. Laurent sells all kinds of delicate cakes and pastries, dressed up very beautifully. 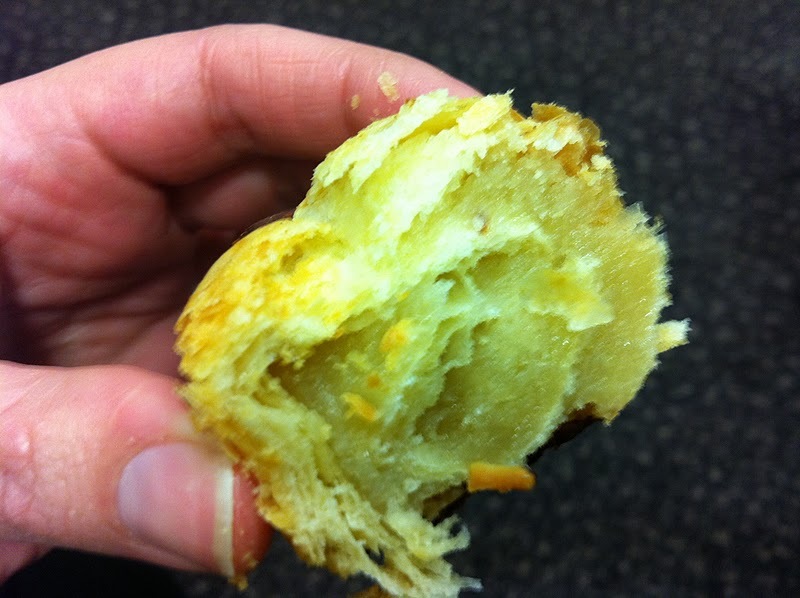 One of their tastiest offerings is not the prettiest at all - it is the almond croissant, a soft, flaky, buttery pastry filled with almond paste. As you can tell from all the exclamation marks, this was a very exciting assignment. I got about a 50% strike rate with my croissants. All of them looked like croissants, but some of them ended up being too small and baked up fairly hard as a result. Of the remainder, they certainly looked and tasted the part. 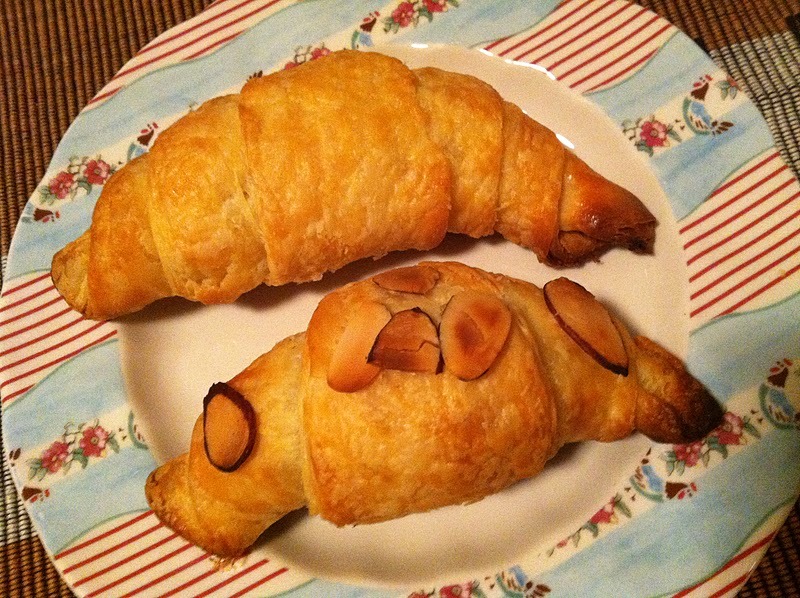 At the top of this post, I have deliberately featured the star performers of my croissant batch - the plain croissant and the almond croissant, filled with almond paste left over from some other challenge. Thanks to Sarah for hosting us this month. I certainly enjoyed this challenge, and can tick off "croissants" from my baking bucket list. To see what the other Daring Bakers did with this challenge, you can view the slide show over at the Daring Kitchen (from 27 September US time). I am very excited that summer is approaching. The weather is getting warmer - at least during the day, although the nights and early mornings are still chilly. There are flowers blossoming everywhere, releasing their delicate scent into the air, and providing a pleasant sensory surprise around every bend. One of the best things about summer is the bounty of fruit that comes into season - watermelon, pawpaw, cherries, bananas, apricots, peaches, raspberries and plums. This week's Tuesday with Dorie recipe, Flip Over Plum Cake, chosen by Becky of Project Domestication, features very summery plums. Unfortunately, plums are not yet in season here, but I bought tinned plums and used those. This cake tasted very pleasant - it has a soft, buttery, spongy top, with the baked, spiced fruit beneath. I can understand why there is no photo of this in the book - it doesn't look that pretty, and because of its soft, fruity bottom, you can't get a neat slice for a photo. Accordingly, my photos are realistic rather than arty. Thanks to our host, Becky, for choosing this recipe - she will have it on her site. And visit the LYL section of the TWD website for various fruity versions of this dessert. On the weekend, I went to stay an Angelsea, on the Great Ocean Road, with a group of friends. We rent a big house which comes equipped with a TV, DVD player and a tennis court, bring lots of food and beverages, and spend the weekend just enjoying it all. One of my friends is gluten and dairy intolerant, so when Dressed and Eaten reposted a recipe originally from Lorraine of Not Quite Nigella for a gluten free (and incidentally, dairy free) chocolate and apple cake, I knew this was the dessert for me to make for the weekend. My only tip for this easy to make cake is to line the bottom of your pan with baking paper. I used a pan where some of the non-stick covering had come off, and despite my oiling it liberally with cooking spray, my cake still stuck to the bottom, resulting in another session of "cake makeup" - that is, chocolate icing to cover the flaws. The resulting cake is moist (presumably from the grated apples) and has an interesting texture from the almond meal. The boys seemed to enjoy it, and that is the proof of the pudding for me. Accordingly, next time you are looking for a gluten free, dairy free cake, this one is definitely worth a go. I am a cheesecake fiend, but I avoid it as much as possible because I know that it will go straight to my hips. It is especially hard to avoid when I work near a cheesecake shop that sells cheesecake by the slice for $3.45. As it has been a while since I made cheesecake, I thought it was time to lift the curfew and try out a recipe emailed to me by my Mum in 2004, and which until now I had not made. Her recipe is for lemon and passionfruit cheesecake. She probably got it out of a magazine, but its origins are lost in the fog of time. This cheesecake is no-bake, making it super easy to put together. The base is also a crushed biscuit base, which means there is no pastry rolling either. It contains store bought lemon curd and tinned passionfruit pulp, and if you have a food processor to crush the biscuits, the whole thing is a breeze to put together. The end result is a tangy, lemony cheesecake that is not at all heavy on the palate. As an added bonus, it is made in a slice tray, so that you cut it into neat little squares instead of wedges - so of course you can have more than one piece! Line a bar/slice tray with baking paper, and spray the baking paper with cooking spray. Blitz the biscuits into breadcrumb size pieces in a food processor, or crush them with a rolling pin. Melt the butter, and pour it over the crushed biscuits. Add the cinnamon and vanilla, and combine well. Press the mixture into the prepared bar/slice tray and refrigerate while you make the filling. Dissolve the gelatine in the water, and set aside to cool slightly. Cut the cream cheese into cubes, then using an electric mixer, beat it until smooth. Beat in the lemon curd, followed by the passionfruit pulp and the gelatine. Pour the cheese filling over the chilled biscuit base, smooth the top with a spoon, and refrigerate over night or until set. Cut the cheesecake into squares (~20) and serve chilled. Unfortunately, I have never understood the allure of the madeleine. Sure, they look cute with their little scalloped shell shape, but ultimately, they are just little sponge cakes, which don't really do it for me. Proust is welcome to them. Madeleines and I also have a chequered history in the baking department - there is always something that doesn't go quite right for me. When I made chocolate madeleines for Tuesdays with Dorie, they were flat - not a hump in sight. This week, for French Fridays with Dorie, our task was Honey-Spiced Madeleines. I certainly got the trade mark humps on the back of my madeleines this time; however, they baked out over the moulds, and I overbaked them, so they turned out rather dark on the side which rested on the madeleine mould. As the rest of the madeleines were springy and just as they should be, after I took the photo at the top of this post, I did what any self-respecting female does to cover her flaws - I put "makeup" on them in the form of chocolate icing. Before icing the madeleines, I tried one of them, and unfortunately, my indifference to madeleines remains - they are just sponge cakes, and even some honey and spices (ginger, cinnamon and cloves) could not change that for me. My fellow FFwD bakers may have very different views on the madeleine, so be sure to check out the LYL section of the FFwD website when it becomes available (which will be Saturday my time). A little while ago, the Tuesdays with Dorie group made Golden Brioche Loaves. The recipe in Baking From My Home To Yours made two loaves, and Dorie recommended against halving it. As instructed, I made the full recipe, but instead of making two brioche loaves, I made an apple brioche tart, inspired by Dorie's Brioche Plum Tart. The original recipe for that tart can be found here at Chez Us. 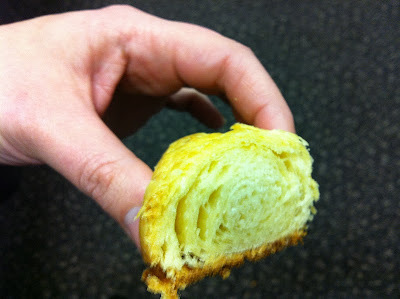 However, instead of using the special brioche dough for this tart, I used the other half of my golden brioche tart dough. I also substituted plums for apples (it being winter when I made this tart), and used raspberry jam in the base (as you can't readily buy apple butter here). This tart was absolutely scrumptious - there's not much more I can say about it, as the brioche recipe itself is just heavenly. If you have some time on your hands, I highly recommend making Dorie's Golden Brioche Loaf dough, and making with it what you please - it is versatile and delicious. This week's Tuesday with Dorie recipe was chosen by Tia of Buttercream Barbie, and is Dorie's Salt and Pepper Cocoa Shortbread. As the name suggests, these cookies contain salt and pepper for a little zing. Other than that, they are your basic "icebox" style cookie, made by forming and chilling logs of dough, then cutting off rounds for the cookies. I thought these tasted fine, but not being a cookie girl, I probably won't make them again. But hey, that's just me - my colleague, Lee, told me these were "sensational", so you'll just have to try them for yourself. Visit Tia's site for the recipe, or buy the book. And you can check out everyone else's point of view at the LYL section of the TWD website. Today for a change, I am featuring a cake that I have selected and made just for me. It's Woody's Lemon Luxury Layer Cake (don't you love that alliteration?) from Rose Levy-Beranbaum's Rose's Heavenly Cakes, and I think it is one of the prettiest cakes that I have ever made. The cake is a white chocolate cake with only the faintest hint of lemon, sandwiched together with lemon curd and white chocolate and lemon curd buttercream, then coated in more white chocolate and lemon curd buttercream. 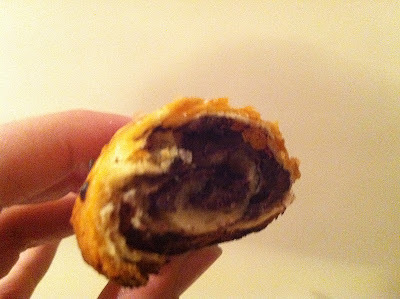 The buttercream was quite unusual as it involved making a chocolate custard and cooling it before proceeding on. I diverged from the recipe only in that I used Stephanie Alexander's lemon curd recipe instead of Rose's, because I had spent part of the weekend before making it and thought it would be silly to make even more just for this cake. I also did not put more lemon curd on top of the cake, as people who came before me in making this cake indicated that it was not that aesthetically successful. The cute yellow sugar chrysanthemums are from The Crabapple Bakery, and what looks like grey dots in the photo is in fact edible silver disco glitter. Unfortunately my lovely flowers got smooshed into the top of the buttercream when I put the cake into the cake carrier because the cake was so tall - hence why the flowers are so deep into the top of the cake in the photographs. If you don't have access to Rose's book, the recipe is published online here. However, if you enjoy baking occasion cakes, the book is well worth buying. Plenty of people have made this cake before me, so if you are interested in step by step pictures on how to make it, just do a Web search. I loved the white chocolate cake and the lemon curd, but the buttercream was not for me - primarily because I generally don't like buttercream. This cake is also quite rich, so a little piece goes a long way. Go on, have a slice - I know you want to ;). This week's French Friday With Dorie recipe is Cinnamon Crunch Chicken. This comprises chicken breast strips coated with creme fraiche and broken up speculoos. Speculoos are not readily available here, so I used gingernut biscuits instead hence ginger crunch chicken. I also substituted natural yoghurt for the creme fraiche. This dish makes a delicious change - I would happily make it again. Visit the FFwD website to see what everyone else thought of this dish. 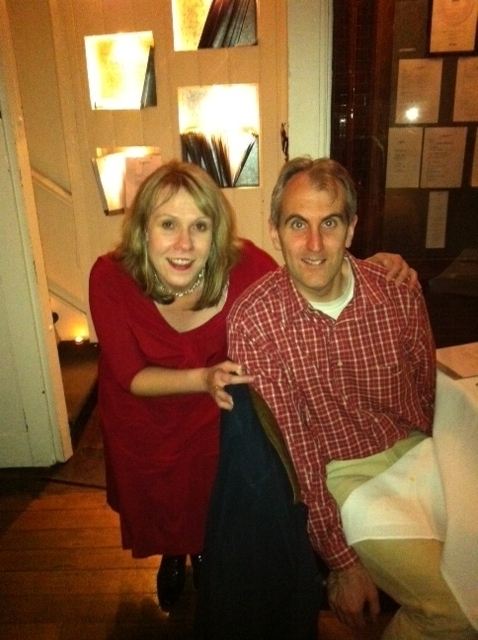 On Saturday night, Tim treated me to dinner at a lovely restaurant called Wildflower, tucked away just off historic Maling Road in Canterbury. Wildflower is self-described as "modern Australian cuisine with old world charm", and Wildflower certainly is a charming restaurant. Wildflower is located in an old style building, where the facade has been left largely untouched. Entry is via a shabby chic wooden door with a metal handle in the shape of the restaurant's namesake. There are upstairs and downstairs dining facilities, with the upstairs seemingly occupied by large groups for functions, while downstairs is reserved for other diners. When the weather is warmer, there is also outdoor dining facilities. The tables are set with crisp white linen and sparkling silver cutlery, adding to the traditional charm of the place, as does the semi-dark mood lighting. On arrival, we were served with cute little savoury brioches in tiny ramekins, as featured at the top of this post. 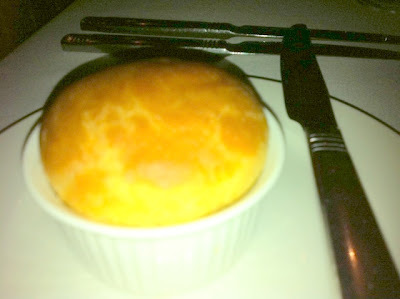 The brioche was served with garlic butter. We washed down our brioche with some sparkling wine. 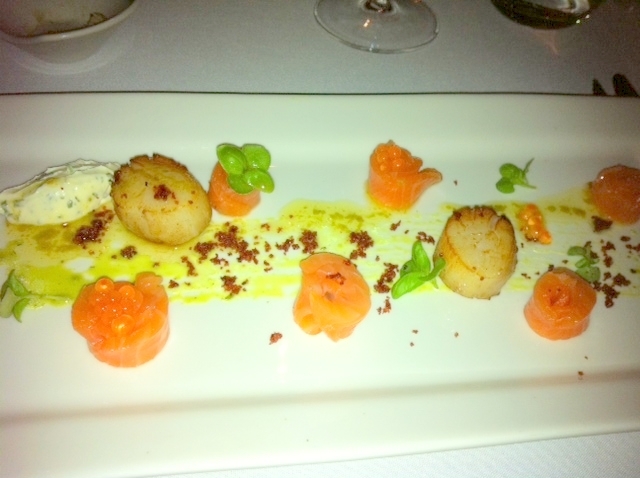 I have no idea what the crunchy bits were on the plate, but they made the dish - I wiped up every last crumb with the delicately flavoured, citrus cured salmon served elegantly in small curls. Again, this dish was served prettily with a shot glass of soy sauce and edible flowers. Tim gave me one of the quail eggs, which squirted runny yolk on being cut. 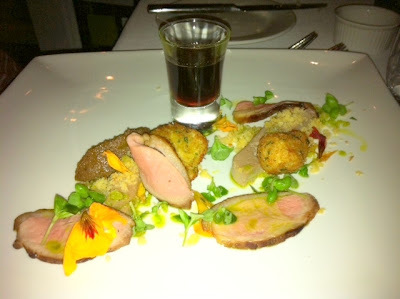 I found the quail egg a little rich, and much preferred my own entree, though Tim enjoyed the richness of the dish. I have no idea what the jellied substance on top was, or the meat in the white casings (perhaps marrow? 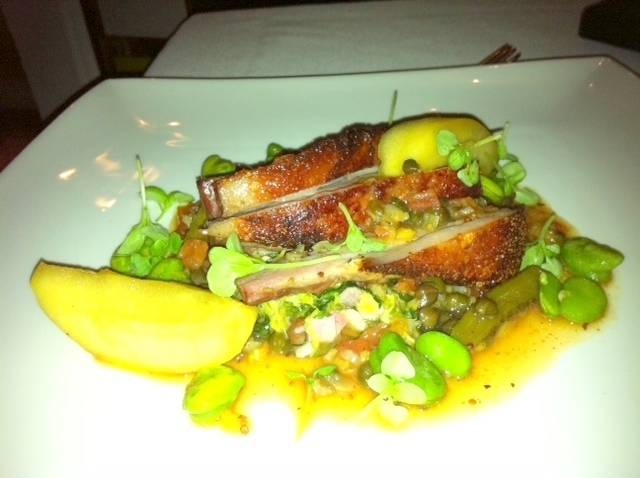 ), but I do know that it tasted good, although of course quite rich, being lamb. The dauphinoise comprised of alternating layers of thinly sliced carrot and potato, sliced into a neat rectangle, and was visually quite stunning, if not overly flavoursome. The sauce accompanying the dish complemented it nicely. I stole a slice of cooked apple from Tim's plate, and it was delicious. I cannot give more accurate descriptions of any of the above dishes as I did not take notes, and the menu online does not match the menu that we chose from on the night. The real star of the evening for a sweet lover like me was the desserts. Wildflower has an extensive dessert menu, which you can find on their website, and the hardest part was choosing what to have. This dessert was so gorgeously plated to be as pretty as a picture. The rhubarb custard is the pink nut encrusted part in the top left. The tuiles were like very thin rhubarb fruit roll ups. The Turkish delight, in the top right, was sweet, melt in the mouth and coated thickly with icing sugar. The vanilla bean icecream, in the bottom left, was smooth and silky and pleasantly sweet. Only the rose foam was not quite my thing. 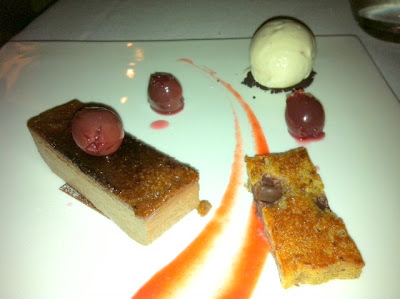 Overall, this was a marvellous dessert, and I would order it again. The thing I loved about all of Wildflower's food was that it was all light and non-overpowering, so that we each finished three courses without a struggle (even I, who had had a three course lunch at a work charity function earlier in the day). The service was delightful and attentive, especially the pretty blonde waitress who greeted us on arrival and periodically served us, topped up our water glasses and took our dishes away. I would go back to Wildflower in a heartbeat - it was a wonderful dining experience at the slightly higher end of the dollars scale. Our assignment for this week's Tuesday with Dorie was to make Classic Brownies, chosen by Anne Strawberry. There is a lot of divided opinion as to what is a "classic brownie", but these are made with chocolate, no cocoa, contain walnuts, and are cakey rather than fudgy. Being an Australian, I don't have fixed views on what a brownie should be like, so I enjoyed these. My only disappointment is that there weren't enough of them! Thanks to our host, Anne, for choosing this recipe - it will be on her website. 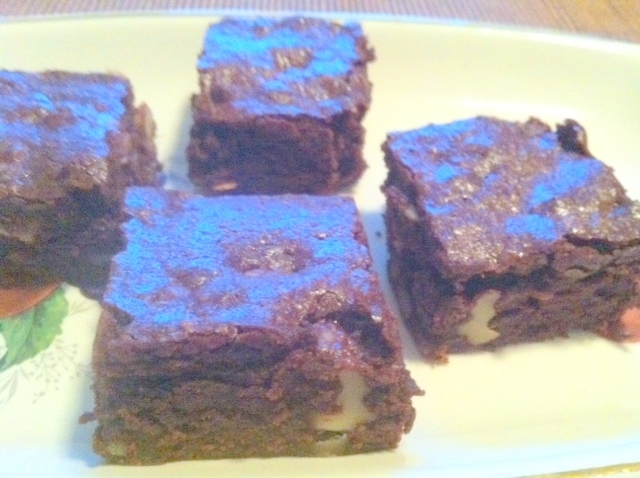 To see what everyone else thought of these brownies, visit the LYL section of the TWD website. Unbelievably, a decade will have passed tomorrow since the terrible events of 9/11 2001 in the United States. It was surreal when I switched on the television before work on 12 September 2001 Australian time to see the horrific images of planes being flown into the World Trade Centre in New York City. I myself had been to the "top of the world" in one of those towers less than two years earlier, and it took quite a while for me to fully register the events that occurred there and in other parts of the US. It was beyond my comprehension that such things could be even thought of, yet alone be implemented. Marla of Family Fresh Cooking has asked us to join her in baking a remembrance cake to remember all those who lost their lives in the terrible events of 9/11 2001. For my remembrance cake, I have chosen Emma's Honey Cake from Jewish Cooking Jewish Cooks by Ramona Koval. While honey cake is traditionally served at Rosh Hashanah, the Jewish New Year celebration, Emma herself bakes it whenever she entertains, so I thought - why can't I? I used all of the optional add-ins suggested in the recipe, but I think I would leave out the raisins next time. I was pleased when my colleague, Vlad, who is Jewish, recognised this as a honey cake, not just any old cake ('cause I don't label my baking). His only suggestion was to add more walnuts - so you may choose to do so if you bake this cake. It was also said to be a good honey cake - which I am also glad about, as I have read on the Web that honey cakes can tend to be dry. Preheat your oven to 180 degrees Celsius (350 degrees F). Grease a 10 cup bundt tin. In a stand mixer, beat together the eggs, honey and sugar. Add the coffee, then the oil and beat for a few minutes. Add the remaining ingredients and combine with a rubber spatula. Place the cake into the pre-heated oven for 1 hour or until cooked through (mine was left a little too long, I think). Allow the cake to cool in the tin for 5 minutes before turning onto a wire rack to cool completely. Please join with Marla in remembering those who were lost in 9/11 - bake a remembrance cake, post about it and don't forget to post your link at Marla's site. It's French Fridays with Dorie time again, and this week's dish is creamy, cheesy, garlicky rice with spinach. This dish would be good as a side or as a meal on its own. It consists of rice cooked in chicken broth, then mixed with onion, garlic, spinach and cream. It is surprising how delicious this simply dish is. Me, I am taking some for my lunch tomorrow. 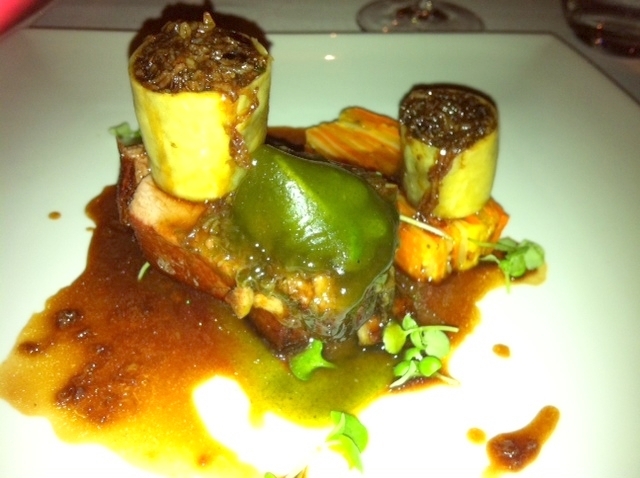 To see some other perspectives on this dish, you can later visit the LYL section of the FFwD website. I have made no secret of my terrible cookbook habit. When I see a gorgeous cookbook, especially a baking book, resistance is useless, and it must be added to my burgeoning shelves. As I write this, I am contemplating buying The Birthday Cake Book by Fiona Cairns (cake maker to the stars and royalty), which I spied in a Paddington bookshop on my Sydney trip. Unfortunately, this addiction means that I have not cooked anything out of some of my books. No matter how beautiful, I never seem to get around to it before the next shiny cookbook has my attention, so they sometimes languish unused on the shelf. A beautiful cookbook that I have owned forever and until recently not used is Donna Hay's Seasons cookbook. Seasons is one of those books that you can just gaze at the pictures, like a fairy story, and be quite satisfied and comforted. However, I finally got around to making not one but two recipes out of it recently. I have coveted forever the Passionfruit Syrup Yoghurt Cake in Seasons, so that was the obvious choice for my first foray into Seasons. As I had a shoulder of pork in the freezer, I also made a cider pork roast out of the book, but I will save that for another post. I did not get anywhere near enough syrup to coat my cake entirely like Donna and Lorraine, but there was still enough to add flavour and moisture to the plain cake beneath. I chose to make my cake in a rose flavoured bundt tin to add to the visual appeal, and I think it looked like an exotic tropical lily, which exuded an elegant passionfruit and vanilla fragrance. You might have noticed that things have been a little quiet around here, and if so, you would be correct. I was away for three days last week in Sydney, so did not have much time for looking after my blog. My hotel was situated in The Rocks, Sydney, and the view from my hotel room window, featured at the top of this post, was of the Fort St Public School and the Sydney Observatory. You can also probably guess that this is not the type of hotel I could afford to stay in if I was footing the bill. On Friday and Saturday, I met some great people at a conference, and learned some new things. However, all work and no play makes me a dull girl, and I was there with my friend E, so we decided to do some exploring. We then went for a stroll around The Rocks Weekend Markets, at which I bought some delightful dried fruit and walnut rolls. The markets feature arts, crafts, fashion and food, and they are set in and about some great cafes and shops. At the markets, I also spied a lovely pale blue floral sundress in this style, handmade by Poise Fashion, which I snuck back to buy the next day. and went shopping in Paddington, where I scored the Orla blouse from Rodeo Show that I had wanted for ages at half price. The mash in particular was superb, and the puff pastry lid was giddily high, light and crispy. We plonked down on the couches pictured in the photo and enjoyed our meals with a glass of red each - E an organic red, me with a Six by Six Pinot Noir. Feeling relaxed and happy, we opted to have another drink, but E also wanted a cigarette. By chance, when she went to the bar to ask about smoking facilities (as NSW pubs have strict non-smoking laws), she struck up a conversation with a guy at the bar called Matt and offered him a cigarette too. Matt came up with us to the smoking area on the outdoor balcony, and turned out to be a great conversationalist. He told us he was a voice artist, and subsequent research showed he was the well known voice artist, Matt Thomas. Matt is the loveliest guy ever, so do believe the testimonials on his website, and consider him if you ever need a voice artist! By that stage, it was time for a quick dash through the City and back to The Rocks, then on to the Qantas Club and home. It was a lovely weekend, which I hoped would never end, but alas, this too shall pass. Oh well, it's a good excuse to go back to Sydney soon. This week's Tuesday with Dorie recipe, selected by Jessica of My Baking Heart, is Chocolate Spice Quickies. As the name suggests, these are little chocolate flavoured cookies, containing crushed almonds and not a great deal of spice (I used cloves). The title of this recipe would imply that they are quick to make, but this is not true. You need to chill the dough for 4 hours, and there is a bit of fussing around with melting chocolate and shaping logs along the way. As I started making these at 7.30pm on the night before posting day, needless to say I froze my logs for an hour or so instead of chilling them. These cookies were OK, but not a knockout. They are definitely pleasant, but they didn't have the added zing to make me love them. Thanks to our host, Jessica - she will have the recipe, or buy the book. To see some more of these cookies, visit the LYL section of the TWD website.